America’s first career illustrator was Felix O. C. Darley, who began regular, freelance work in the 1840s creating pictures for the books of well-known 19th Century authors like Washington Irving, James Fennimore Cooper, and Charles Dickens. Artists typically were on staff at printing companies or newspaper offices, creating drawings on-the-block for engravers or drawing on lithographic stone plates for poster publishers, or they were employed as colorists, hand painting over line engravings. Art training in the United States was scarce in the early 19th Century, and most artists were self-taught. 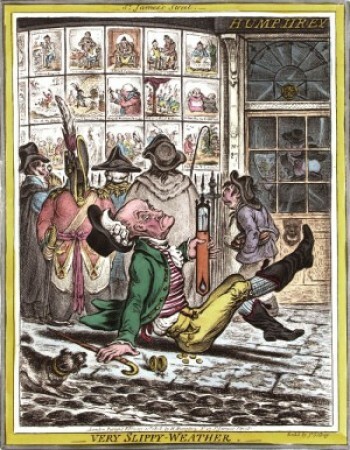 In Europe, especially in England and France, books, journals, posters, and satirical prints were illustrated by artists who were either formally educated or had been apprenticed in workshops. In England, the innovative John Harris published an early children’s picture book, The Comic Adventures of Old Mother Hubbard and Her Dog in 1805, with original line art by Sarah Catherine Martin, a former staff colorist. 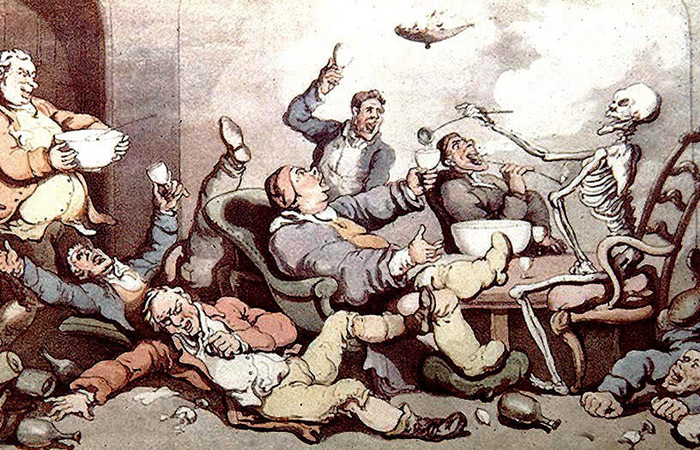 The etchers George Cruikshank, James Gillray and Thomas Rowlandson made successful careers as book illustrators and satirical printmakers. John Tenniel (illustrator of Lewis Carroll’s Alice books), John Leech, and Hablot K. Brown were cartoonists for Punch, the English satirical magazine. In France in the 1830s, the engraver and caricaturist Charles Philipon launched two satirical magazines: La Caricature and Le Charivari. 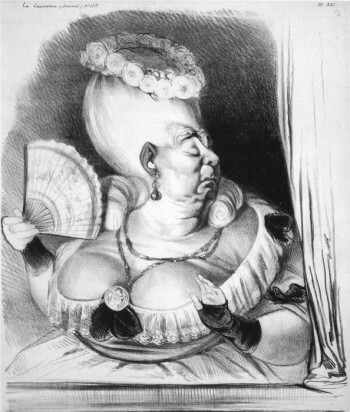 These were illustrated with the lithographic drawings of Honoré Daumier and Grandville (Jean-Ignace Gérard). Daumier produced about 4,000 illustrations in his lifetime and spent six months in prison for drawing a caricature of King Louis Philippe. 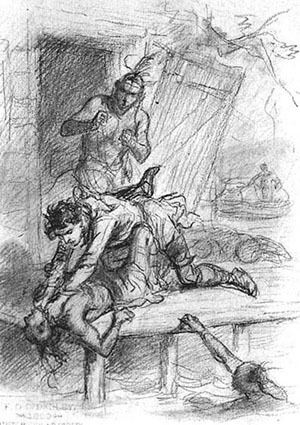 Popular novels by writers like Émile Zola and Charles Dickens were often published in sections and Dickens was the first writer to actively collaborate with an illustrator, Hablot K. Browne (“Phiz”). As each installment was written, the artist would create drawings which might in turn suggest characters or their physicality to the writer. 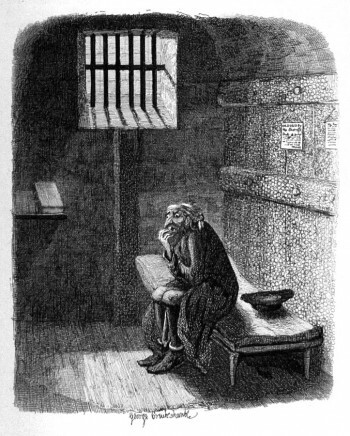 George Cruikshank worked with Dickens on Oliver Twist and also drew plates for children’s books and comic alphabets. Gustav Doré learned engraving and drew for the Paris weekly newspapers while still in secondary school and he was a well known caricaturist by the age of 22. 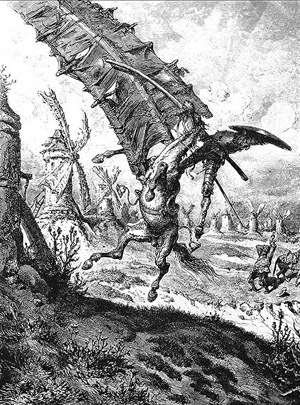 As his engraving skills increased, he turned to book illustration, creating lively, exciting pictures with memorable characters and scenes like those done for Don Quixote de la Mancha. Doré’s output was enormous. From his atelier, and with the help of assistant engravers, he produced grand and powerful pictures for books by Rabelais, Shakespeare, Honoré de Balzac, Victor Hugo, John Milton, and Edgar Allan Poe. His fame and popularity far exceeded that of any other book illustrator of his time and he led a wealthy and fashionable life.